Kevin Costner reaches a welcome career high in this new movie, a live-action based-on-a-true-story inspirational tale of school sports, produced by Disney. It sounds a little over-determined when described that way, I know. But one thing I almost forgot going into this picture is that this kind of picture is the kind of thing that Disney can do very well. And it is very well done here, thanks in no small part to the superb direction of Niki Caro. Caro, a New Zealand-born woman, might seem to some an unusual fit for the story of an all-Latino cross-country running team coached by a white man who’s working, against his will for all intents and purposes, at an underfunded high school in the California town that sometimes advertises itself as “the fruit basket of the nation.” But Caro, who established some good cross-cultural uplift bona fides with her first feature, 2002’s “Whale Rider,” brings huge reserves of both curiosity and empathy to the story, and her abilities as an entertainer keep the movie generous in both heart-tugging and smile-inducing moments. Costner’s uncanny evocation of Gary Cooper masculinity and Gregory Peck compassion in the role of coach Jim White is the glue that holds it together, but the rest of the cast is equally inspired. There’s been a lot of talk in cultural criticism of the last several decades about “white messiah” narratives: stories in which the intervention of a Caucasian rescues ethnic minorities at risk. (You may remember “Dangerous Minds.”) Many representatives of ethnic minorities in academia and media find this irritating, with good reason, and despite its based-on-a-true-story status, “McFarland, USA” could very well be just such a story. But Caro, along with writers Chris Cleveland, Bettina Gilois and Grant Thompson do something unusual. It’s not something as obvious and crass as the “and she saves him back” trope of “Pretty Woman,” but more along the lines of a family values cultural exchange. Costner’s Jim White is a high school teacher and coach whose passionate temper gets him fired from a series of gigs in the white-bread towns of which he’s a product and has been a fixture. On arriving with wife (Maria Bello) and two daughters, teen and pre-teen, in a town where the rooster next door wakes everyone up before five and Jim can’t get a burger, the teacher is almost immediately assailed by colleagues and students who think it’s hilarious that his name is “White.” Despite his chafing at his fish-out-of-water status, White also gives a damn, and he, like Caro, is a keen observer. He knows the school’s football team isn’t, and likely can’t be, worth a damn, but once he sees more than one of his students running, rabbit-like, to get to their after-school jobs helping their parents and other family members with produce-picking, he resolves to create a cross-country running team. To make it work he has to gain the trust of both the kids and their parents, and that means he needs to give a little of himself. Getting involved in the lives of these self-described “pickers” gives White a painful understanding of the economic realities of his environment and the privilege that he’s long taken for granted. He misses the birthday celebration for his teen daughter Julie, which is a common enough device in the too-busy-doing-good-white-guy scenario, but here it pays off in a dividend, as White gets educated by his prize runner and the local grocery store owner in the Latin American tradition of the Quinceañera. As White steers his initially ragtag crew to victory after victory, he attracts the attention of tonier towns and schools, presenting a challenge to his own commitment to family and community. 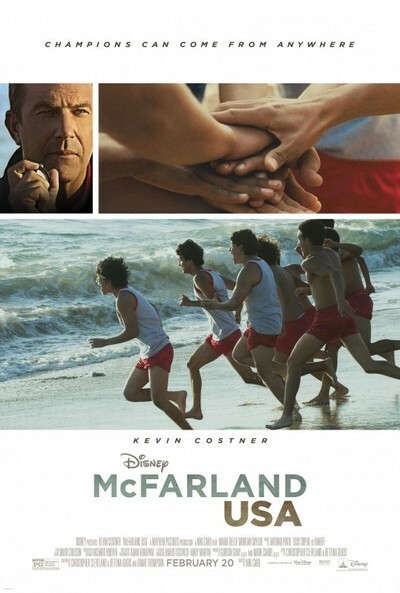 Because, finally, “McFarland, USA” is a paean to family and community. And a story about why, even as so much of what we see about the so-called “American Dream” is tinged with disillusion and corruption, the United States remains a land of some kind of opportunity for millions of people who come here to do back-breaking work, day in, day out. It is also, of course, a really entertaining and enjoyable movie. Caro is particularly deft at handling supporting character roles. All the young runners make an impression, particularly Carlos Pratt as the troubled, gentle, and lightning-fast Thomas, and Ramiro Rodriguez as Danny, the chunky anchor of the team who’s all heart. But Valente Rodriguez as the harried principal and Danny Mora as the aforementioned store owner are also outstanding, bringing un-stereotypical life to their archetypal roles. And while for this viewer, who’s also a sometime runner, cross-country running is perhaps the least cinematically-engaging sport ever, Caro and company imbue each of the race scenes with more than sufficient drama to give the proceedings a good share of “Rocky”-triumphant moments. Tear-jerking ones, too. The result, as far as I’m concerned, is a feel-good movie that pretty much anyone can feel good about feeling good about. Particularly Costner fans.